Thanks to the industry’s obsession with the apocalypse, it feels like we’ve seen almost every permutation of nuclear wasteland possible, even if most of them involve people who are suddenly obsessed with spiky belts and an inability to wear leather properly as soon as the bombs drop. Yet, Kobold Games saw an opportunity where no-one else could and, instead of focusing on worlds full of Super Mutants and Liam Neeson, they decided that their heroes should be the creatures oft-rumoured to be the only ones capable of surviving such a fallout – the humble cockroach. Now with Daedalic Entertainment acting as publisher, they’re ready to unleash their post-apocalyptic adventure on the world, and they’re hoping it’ll leave a megaton impact. 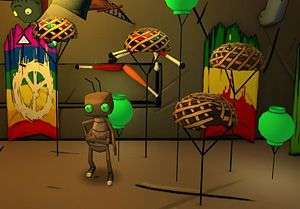 After an animated cut-scene more than reminiscent of fellow Daedalic title Edna and Harvey: The Breakout, players are thrust into the role of Jim, a mostly harmless cockroach who, together with his buddy, aims to make his way out of the nuclear bunker that they’ve become trapped inside. As it transpires, while the roach is well-intentioned, he’s also one of the most accident-prone protagonists ever, and the series of misadventures that he and Bud become embroiled in are solely as a result of Jim’s machinations never working out the way that they ought to. No matter the situation, Jim’s actions will always cause more disaster to rain upon our roachy duo, regardless of his purest intentions. In fact, it seems that Bud’s luck in particular ran out in the title sequence as, once he finds a sole flower rooted in the wasteland, he’s soon trapped under a barrel of toxic waste, attacked by a fish and stuck in a spider’s web. Not only can he not catch a break, but he’s soon estranged from his botanical discovery, and after the incident with the barrel he’s in no position to be doing any heavy lifting with his busted arm, forcing Jim to take charge instead. Controlled through either the traditional mouse and keyboard or a game-pad, Jim has free rein of each environment he becomes encased in, with each room acting as one big puzzle that must be solved before the next part of the madcap adventuring can continue. One way in which Journey of a Roach separates itself from the rest of the genre is the fact that all of the locations are fully explorable in three dimensions, and mastery of each one is vital for progression. Aiding this is the masterful touch of allowing the roaches to climb on all of the walls and ceilings, with the perspective altering to accommodate your current position. While it initially feels like an odd transition, warping your viewpoint soon becomes a natural transition to the puzzle-solving, with some of the early solutions relying on you slowly acclimatising and tutorialising the process. Regardless, it’s not one that I’d be clamouring to try out on an Oculus Rift any time soon. In a rather novel approach to exploring the environment, objects that the player can directly interact with will actually provide a visual clue as to how they should be used when they’re highlighted; items that need picking up will cause the cursor to turn into a grabbing hand, those that can be worn will show up as clothing and puzzle-specific objects will be represented by two jigsaw pieces interlocking. It’s a great way of streamlining the process required to stumble upon the correct solution, as these then become the only way you can use these items, reducing the typical amount of experimentation that comes with the average adventure. 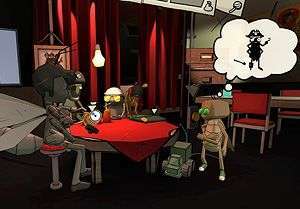 There’s also the presence of the speech bubbles every character produces, providing a visual image or clue as to what the player needs to do next to proceed, not unlike indie darling Machinarium. There’s a very conscious effort to stop players from getting stuck while also making sure that the pacing remains consistent, but it’s not clear whether the effect of this was that the solutions were almost explicitly spelled out, thus making everything seem a bit easy, or whether everything gets altogether more fiendish later on. For now, at least, it seems that navigating your way around each environment and taking full advantage of the fully 3D locations is where the majority of the puzzle-solving lies, but I’m hoping that the difficulty ramps up considerably later on. 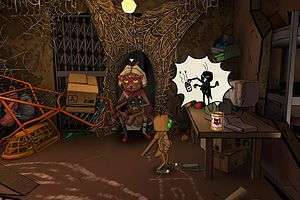 Jim and Bud aren’t the only two creatures stuck in the labyrinthine bunker, and one of the first characters players will come across is what can only be described as the arachnid equivalent of a crazy cat lady. After Jim ruins everything (yet again) by scattering her beloved flies across the room, he’ll soon be put to task and forced to reunite them with a woman whose biological desire to eat them is seemingly replaced by an overwhelming need to coddle them and raise them as pets. She won’t be the only weird cast member our heroes come across, as there’ll also be a regimented army of ants to contend with later on in the story, amongst many others. With a refreshing and unique take on the post-apocalyptic setting that too many other titles have slowly saturated over the years, Journey of a Roach feels like a welcome breath of fresh air, not just for the concept of the nuclear holocaust, but for adventure games too. With an art style that is sure to turn a few heads, an emphasis on shifting your perspective to move forward and one of the most accident-prone pair of heroes around, Kobold Games’ newest offering is sure to raise more than a few smiles and provide a great twist on the genre to boot.